This year, mobile devices out-sold laptop and desktop computers combined. Why should you give a mobi? Because an ever increasing number of people are using the Internet over mobile devices and they are searching for local businesses on them. 98% of smartphone users use their phones to search for local businesses. Have you looked at what your current website looks like on a mobile device? What kind of “user experience” does your site present? What kind of interaction is required in order to quickly find the information the searcher is looking for? You need a mobile website in order to guarantee a good “user experience” for your customers. You need one that offers the best viewing experience so that it makes it easy for potential customers to choose you over your competitor. Often, these users are searching while they are on the go. They may be in their car, at their office, or walking down the street looking for a restaurant, hair salon, or emergency services like a plumber or 24 hour locksmith. When they search for a local business, let’s say “coffee shop” they want to quickly find the location, directions, phone number, and perhaps see a menu or any current specials. Eliminate having to zoom in and out to read the information. 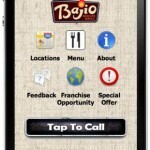 Tap to call buttons so the user can simply “touch” their phone and instantly call your business from their mobile phone. 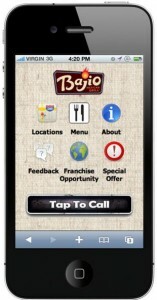 Maps and directions so the customer can easily navigate to your business via their mobile phone or tablet. Optimize large files like photos videos for faster page loading. 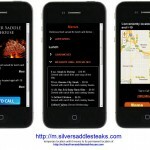 Highlight your menu items, list of services, business hours, etc. and any of the other most important and relevant features that the user can easily pull up on their smartphone. Contact, subscriber/opt-in forms, etc. can all be added as well! 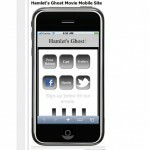 On this page, you can see just a few of examples of how a mobile website can look. 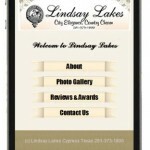 (scroll way down to the bottom to see our photo gallery) Your mobile web site should compliment your full web site. 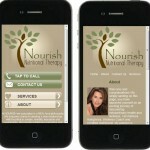 If you want a professional, customized Mobile version of your full website, you’ve come to the right place! 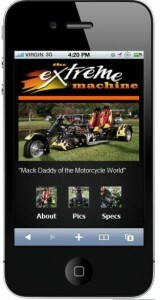 Your Mobile site will be built to meet your expectations but our goal is to exceed them! We’re never happy until you are. 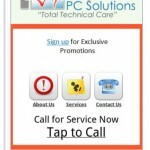 Call us today for a free mobile web site evaluation and complimentary consultation. In Charleston, call 843-647-0489 or thoughtout the rest of the U.S. call toll free: 866-945-9707. P.S. Need more information? Get your free copy of our ebook the “Small Business Guide to Mobile Marketing” today! P.S.S. Don’t forget to see our mobile website photo gallery below. Just a couple of clicks will bring the images to full size.